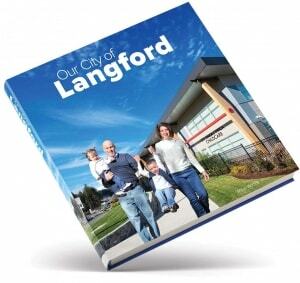 Our City of Langford is our latest publishing project. It is the second edition of a book originally titled City of Langford published in 2011, by Blue Beetle Books with the support of the City of Langford. This is a great example of how a town, city, or region can produce a highly effective economic stimulus tool at little to no cost. Funding for these books comes in the form of leaders in the business community (we call them Community Champions) advance purchasing copies of the books in return for an advertorial corporate profile. This win-win publishing project provides a region and its key businesses with huge exposure and individual Champions with a highly cost-effective promotional tool at a low cost. Check out the promotional flyer for Our City of Langford for more information.